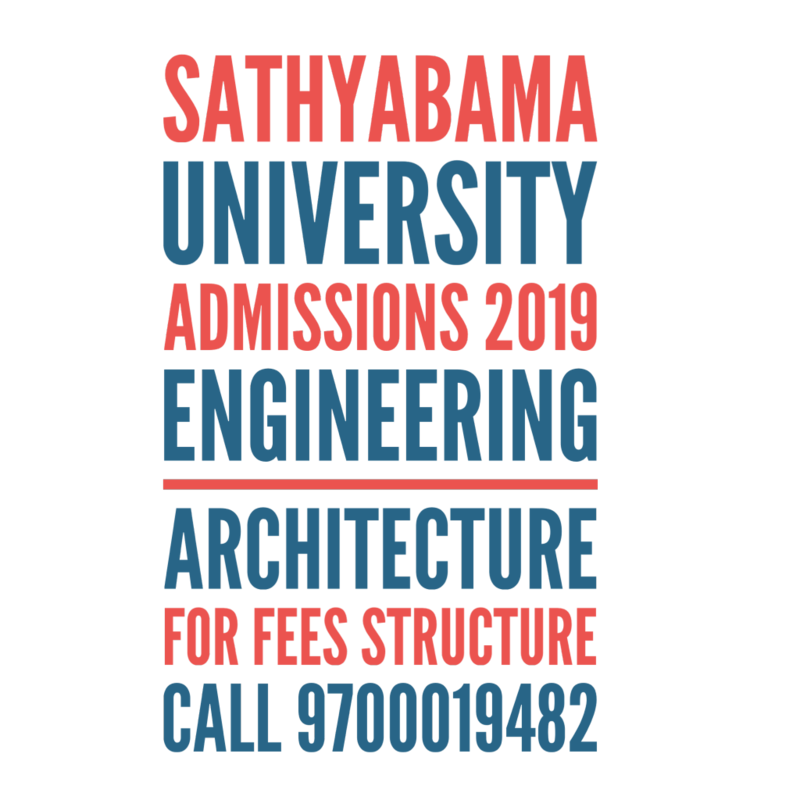 Sathyabama University Chennai Announces Entrance Examination For U.G – Engineering & Architecture for the academic year 2019. Sathyabama University Entrance Exam 2019 (SAEEE 2019). Sathyabama University Admissions 2019 Admissions Open Now! Eligible candidates can get the application form on payment of Rs. 650/- at Sathyabama Institute of Science and Technology Campus. Application forms may also be obtained through post by sending a request letter (candidate’s mailing address should be mentioned clearly in capital letters with pin code number, mobile number and e-Mail ID) along with a demand draft for Rs. 650/- drawn in favour of SATHYABAMA INSTITUTE OF SCIENCE AND TECHNOLOGY, payable at Chennai. This request letter should reach on or before 6th April 2019 to “The Co-ordinator, Entrance Examination-2019, Sathyabama Institute of Science and Technology, Jeppiaar Nagar, Rajiv Gandhi Salai, Chennai-600 119”. Filled in Data Sheet can be sent to “The coordinator, Entrance Examination-2019, Sathyabama Institute of Science and Technology, Jeppiaar Nagar, Rajiv Gandhi Salai, Chennai-600 119” on or before 6th April 2019. CANDIDATES ARE REQUESTED TO RETAIN A PHOTOCOPY OF THE FILLED IN DATA SHEET AND NOTE THE APPLICATION NUMBER FOR FUTURE REFERENCE. APPLICATION NUMBER MUST BE REQUIRED TO TRACK YOUR APPLICATION AND TO BOOK THE SLOT FOR COMPUTER BASED EXAMINATION. Candidates can also use online submission of application which is available at www.sathyabama.ac.in. Candidates opting for online submission should fill the application and verify all the details entered. After the verification of the details, online payment of Rs.650 + Bank Charges.should be made either by using Net Banking Facility/Credit Card/Debit Card or offline payment (only by Indian Bank Challan mode) at any one of the INDIAN BANK branches. The candidates who have submitted the applications through online mode need not send any printed forms/account statement/bank or institution challan copy etc. unless otherwise requested by university authorities. But they should note the application number, login username and password for future reference (application number must be required to track their application and to book the slot for computer-based examination). Applications without the fee payment will not be considered. CANDIDATES PASSED IN COMPARTMENTAL CLASS / GRADE (OR) PASSED WITH ARREAR/S EITHER IN 10th CLASS OR IN 12th CLASS ARE NOT ELIGIBLE FOR ADMISSION. A pass in the 10th class or Equivalent Examination with a minimum aggregate of 60% marks or “6.0” CGPA. The candidate opting for these programmes should appear for Mathematics, Physics and Chemistry in the entrance examination. The candidate opting for this programme should appear for Mathematics, Physics and Chemistry in the entrance examination. The institution offers REMIBAI JEPPIAAR SCHOLARSHIP to students who secure the top three positions in the Institution Semester Examinations. A student consistently maintains top rank in eight consecutive semesters is eligible for a maximum Scholarship. Hostel facility will be allocated on First Come and First Serve basis.